It should come as no surprise to ComicsAlliance readers, particularly those of you who're regular followers of our Best Art Ever (This Week) pin-up feature, that we are devoted fans of Bruce Timm, the artist, writer and producer behind such hits as Batman: The Animated Series and Justice League Unlimited. Unfortunately, Timm has produced relatively few comic books, no doubt a consequence of his commitments at Warner Bros. Animation, where he continues to work on the studio's line of original animated features based on the DC characters, not to mention new shows like Green Lantern: The Animated Series. So it was with great surprise that we discovered this lost Timm treasure, a seven-page Vampirella story from 1999, fully drawn and colored by Bruce Timm and written by another Batman Adventures alumni, Ty Templeton.Bruce Timm is rightfully beloved by DC Comics fans for his enormous body of work with the characters in various animated television shows like Batman: The Animated Series and Justice League Unlimited -- series which many identify as the best expressions of the DC icons in any medium -- and his distinctive drawing style defined a generation of animation, influenced countless comic book artists, and endeared itself to illustration aficionados the world over. Among them are the good people at Dynamite Entertainment, who acquired the Vampirella property in 2010 and have been reprinting archival material in a series of handsome volumes. 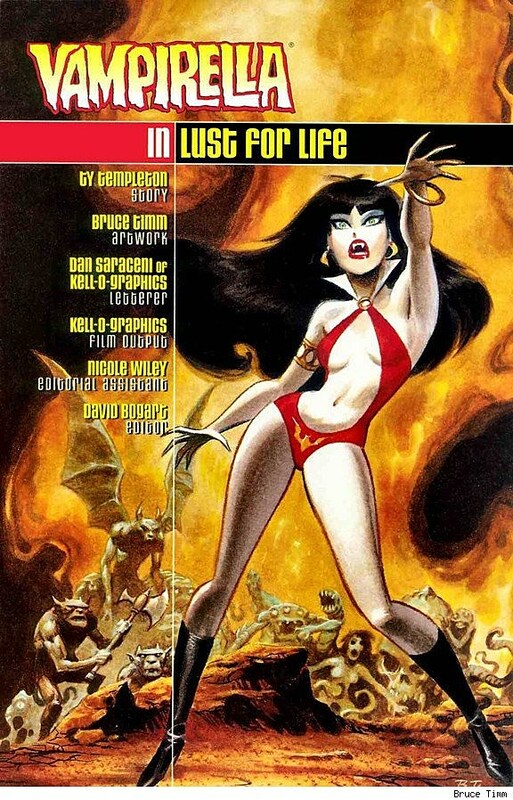 On sale now, Vampirella Masters Series Volume 4 features Timm and Templeton's "Lust For Life," which was originally published in 1999 in Vampirella Monthly #20. You can buy the book in finer comics shops as well as online retailers like Things From Another World. Despite the character's ubiquity, I'd never in my life actually read a Vampirella story. I know nothing about her beyond the obvious: she is a practically naked vampire lady who most of my favorite artists have drawn at some point or another. While my experience with Vampirella is limited to just these seven pages created by Templeton and Timm, I think I get the character and her back story completely, and I'm reasonably certain it's the best and most beautiful Vampirella story ever produced.